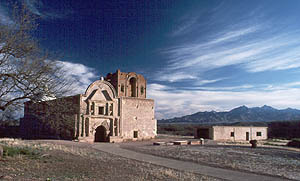 Tumacácori Mission (San José de Tumacácori) was founded by Jesuit missionaries in 1691. 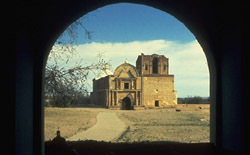 Constructed in 1757, the original mission included a small church and compound. In 1799 a more imposing church with a painted interior was built by Franciscan missionaries. Other sites in the mission compound include a small mortuary chapel, the ruins of the convento (missionary residence), a granary, remains of an Indian village, a historic cemetery and the remains of the mission garden and orchard. Also located within the jurisdiction of the park are the ruins of San Cayetano de Calabazas, one of the mission's visitas (satellite communities) and Los Santos Angeles de Guevavi, a church associated with the mission. Tumacácori National Historical Park, administered by the National Park Service, is 19 miles north of Nogales, Arizona, at exit 29 off I-19. A self-guided tour is available; open daily 8:00am to 5:00pm. Please call 520-398-2341, or visit the park's website for further information.